After seeing and experiencing the desperate need for homes to be rebuilt, Gary and the Young Living Foundation immediately put a plan into action. In Yarsa, a mountain village completely destroyed by the earthquakes, the Foundation is rebuilding 100 homes and a primary school. To help us accomplish this and supply more than 50 jobs to unemployed locals, we’ve set up a brick-making plant in the area. Not only will the brick-making plant supply jobs to locals who are currently unemployed, it will also make use of an over-abundant local resource: mud. Gary has been spearheading the project and has traveled to Nepal multiple times to guide the construction efforts. We have also hired local construction workers and engineers and are using local equipment and materials where possible. A year before the earthquake, Pasang Sherpa took out a $5,000 USD loan to build a nice home for his wife and two sons in Yarsa. They were only in their new home for a few months when the earthquakes hit, leaving the home in complete ruins. Their food and clothes were buried under the rubble, and, like most families, they were forced to take shelter with the livestock before building a temporary tin home. But the loan for their now destroyed home was outstanding, and Pasang worked tirelessly to pay it off. 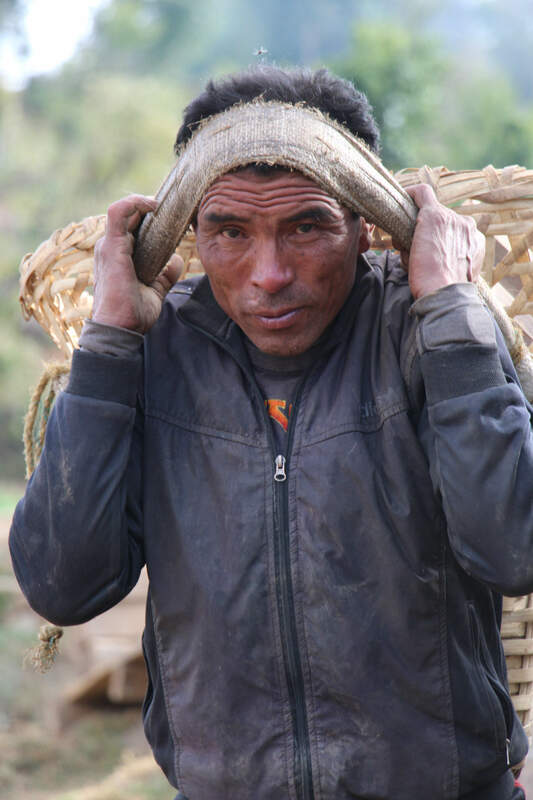 In Nepal, men and women carry heavy items by distributing the weight between their back and with a strap that goes around their head, just above the brow. “I carried heavy bags of cement and rice on my head to the point I have lost a portion of my hair from all the weight," Pasang said as he showed how the hair just past his brow and below the crest has been rubbed away, and the skin underneath is sore and calloused. Having paid off the loan, Pasang had no idea how he was going to pay to build another home. He wept long and hard over the prospect that they may never be able to rebuild and they would spend the remainder of their time living in an inadequate tin shelter. During our February 2017 service trip to Nepal, a team of Young Living members took part in rebuilding Pasang’s home. He worked alongside us as we laid each brick. And as the walls reached completion, the joy Pasang felt was overwhelming. He stood in the middle of his home crying as he showed us where his wife and children were going to sleep. He cried tears of gratitude, and we cried with him. To Pasang and his family, the new, 590 square-foot home is a castle—a castle filled with renewed hope for his family’s future and the future of the entire village. “This new home to me is a big, luxurious palace. I will never forget the Young Living volunteers. You came from a far country… to build me this mansion, this palace." “"You are like a god to me. You have given me and my family new life. I will be forever grateful for the Young Living volunteers."